Robinson coaches her team during a game against Northridge this past season. Thirty-two years after starting the program, Robinson has retired, making 2015 her last season. The 2016 season will be the first year in the program’s history she has not been the coach. WEST ALEXANDRIA — After 32 seasons of coaching, Darcy Robinson will walk away from the Twin Valley South Softball program. She will be leaving a program she started in 1983 and has been the only coach for in its history. Along the way, Robinson’s teams tied a state record, won a district title, and saw three perfect games. Her softball teams may have never won a conference title, despite coming close multiple times, but Robinson will retire achieving a far less superficial version of success. This type of success is not found in records and achievements on paper, but over a life time of being a role model. In her 32 years at the school she has been a part of thousands of teenage lives. Teenagers who walked through her doors where she was both an educator and coach, whom she impacted in a way that wins and losses, or conference or district titles, could never accomplish. “As I’ve gotten older I’ve realized there is a lot more to it than wins and losses, yeah I’m competitive as the next person and I hate to lose, but I like to think you start seeing the bigger picture. Are we developing good athletes? Good people? Are kids learning life lessons from wins and losses?” Robinson said of her time as coach. Not only did she coach softball for 32 years, she was also the health and wellness teacher at the high school. But her involvement doesn’t stop there. She spent 21 years as a varsity basketball coach, and four more coaching on lower levels. And don’t forget about the three seasons she spent as volleyball coach, even if she might. For Robinson her success can be defined by a scrapbook currently siting on a coffee table at her house, one that was given to her by Ali Robertson, a senior on this year’s team. Robertson went through 32 years of yearbooks to gather a picture of every single softball team in Twin Valley South history. “Thirty-two years is a long time to do something and she affected so many girls during that time, so I thought she deserved something to show her how much she was appreciated,” Robertson said of making the book. 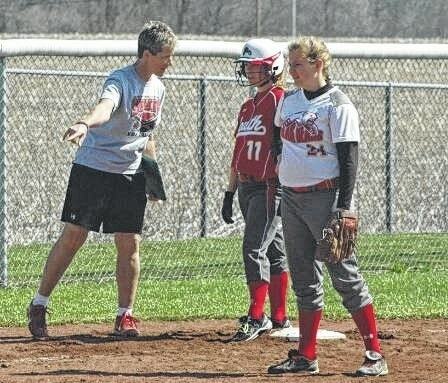 “She teaches her players more than how to be better softball players. She teaches us to become better people. I am who I am partly because of her and I’ve learned things from her that I will keep with me my entire life.” This is something Robertson said she is not alone in, as evidenced by the number of responses she received when making the book for the long-time coach. Robinson said she believes the thing she will miss most from her 32 years isn’t winning a game, but having day-to-day interactions with her students and players and seeing them grow. “Especially those who weren’t the best athletes, to take them from not being very good and seeing them grow not only with their skill level but having more confidence in themselves and being competitive — seeing them mature like that over the course of four years was pretty rewarding,” she said. The early days of the program were rough; Robinson said most of the girls on her first team had never seen fast pitch before. However, Robinson said, the team began seeing better athletes and they became a competitive team. “We started getting pretty competitive within three or four years. It helped because we had good athletes and people who were coachable. What you find out with fast pitch softball is that if you have someone who can pitch, you can be competitive and we had a few good pitchers come along early that helped a lot,” she said. Robinson was close to multiple titles but the team fell one game shy of grabbing the elusive league title several times, including 2012 as the most recent example. For Robinson, however, those near misses don’t matter now, something she believes changed partly with age and the passing of her mother 11 years ago. Robinson, who grew up in Defiance, “kind of stumbled” into Twin Valley South. While attending Defiance College she only knew one thing, she wanted to coach. Robinson took a position at Twin Valley South after a stroke of luck when Bruce Jones, a man she interviewed with for a different school district, called and offered her a job as a health teacher and volleyball coach at newly formed Twin Valley South. (Robinson’s first year with the school was the first year after Tri-County North and Twin Valley South split). She started the softball team the same year and has been there ever since. She has now lived in West Alexandria longer than anywhere else in her life, even Defiance, where she grew up and was a star athlete at Defiance High School. She then went on to play both basketball and fast pitch softball at Defiance College. Robinson is now a member of both her high school and college halls of fame. While at college she became the first woman in school history to record 1,000 points and 1,000 rebounds in a career, according to the school’s website. She also threw the first pitch in Defiance College fast pitch softball history and was the school’s female athlete of the year in 1983. Robinson saw the evolution of sports, especially female sports, over the course of her career. Her freshman year, her basketball season was a once a week, intramural session that only lasted an hour because scholastic women’s basketball was not offered. Her sophomore year was the first year the state of Ohio offered interscholastic women’s sports. Staying in the same small town for so long allowed Robinson to have a chance to coach parents early in her career and their children later in her career. In fact Kelsey Shafer’s (a freshman on this year’s team) mother Susie, was a member of the first team Robinson coached. Coaching multiple generations will always be special to Robinson. Robinson did win a conference title as the girl’s varsity basketball coach in the 1989-90 season when the Panthers were co-champions with Arcanum.She was also the conference coach of the year for 89-90 the season. The three perfect games were thrown by Emily Froment, two in the same season. She was the star pitcher during the district final run when they lost to Parkway 1-0 in the regional semis. Robinson holds a state record both as a player and a coach. On May, 5, 1978 Defiance High School scored 57 runs to set a state record for runs scored in a single game. On April, 16, 2002 Twin Valley South scored 57 runs to tie the state record set by Robinson’s Defiance High School team. Her retirement doesn’t mean she still won’t be seen at games, but for Robinson, perhaps the hardest thing about walking away will be attending the games as only a spectator — after all she is breaking a 32-year habit. If you happen to run into Robinson at a game next year don’t ask her how many conference or sectional titles she owns, ask her how many teenage lives she has impacted. Even if she doesn’t know the exact number, it certainly adds up to being more valuable than any number of conference titles could ever add up to.